It seems to me that Christians, even more than anyone else, ought to be deeply grounded, living a courageous rhythm of rest, prayer, service, and work. That rhythm is biblical, and it’s one that Jesus himself modeled. It seems to me that Christians ought to be free in meaningful and radical ways to bow out of the culture’s insistence on proving and competing. Again, like Jesus. It seems to me that Christians ought to care more deeply about their souls than their bank accounts and pants sizes. But I am a Christian, and I am guilty of all these. My faith has not failed me, but I think maybe I have failed it. Our beautiful historic faith tradition is built on feasts and holidays, Sabbath and evening prayers—a rhythmic, beautiful life with God. And many of us, myself certainly included, have stomped on the accelerator of our own lives and obliterated all evidence of that lovely path laid out for us. But the pattern remains if you squint—if you’re willing to be creative, if you’re fed up enough with the noise and speed of the alternative. I believe that certain strains of our faith have led us to this spot—they shouldn’t have, of course, but this is what humans do sometimes. Christians have made too much out of work in the same way that Americans have begun engaging in yoga competitions—twisted-up versions of a purer thing. Christians want to make a difference. So we do, and we do, and we do, and then we find ourselves exhausted. In more fundamentalist strains of the faith, there’s great value on happiness, constant kindness, selflessness above all else. These are wonderful things . . . that, over time, make it really hard to say things like, “I need help.” Or, “I can’t do this anymore.” Many Christians, women especially, were raised to be obedient and easy, to swallow feelings, to choke down tears. This has not served us well. This has made it far too easy to injure our bodies and our souls in the name of good causes—there are enough good causes to go around. Christians ought to be decidedly anti-frantic, relentlessly present to each moment, profoundly grounded and grateful. Why, then, am I so tired? So parched? So speed-addicted? Again, the fault lies not with the tradition but with the perversion of it, and with the Christian herself—in this case, of course, me. These days, I’m not looking for more to crusade against or for, but trying to reimagine my faith as a soft place, the antidote to my addiction, not the enabler. I’m trying to relearn a set of patterns from the inside out: centering prayer, lectio divina, the prayer of examen. I don’t practice these things instead of Bible study, corporate worship, or service, but alongside them, to build an inner core of silence and substance, unshakable in the business of life. I listen more; I picture God’s heart, red and beautiful; I breathe deeply and try to imagine my faith as protection from this frantic, soulless way of living, instead of one of its motivators. Many of us who have found ourselves to be useful in Christian service have found ourselves unable, if we’re honest, to connect with God any other way. We do for him, instead of being with him. We become soldiers, instead of brothers and sisters and daughters and sons. This is dangerous, damaging territory, and I’ve spent too much time there. These days, I’m relearning daughter-ness, and I find it most through silence and nature. Nature, of course, connects us back to that innate sense of having been created—of order and beauty and humility. We have been made. We are fragile. We live in connection to water and air and plants and sunshine, and when we acknowledge those things, we acknowledge our Creator. Far too often, in the winter especially, the natural world is simply something that disrupts our plans—flights delayed, schools closed. As those words began to take root in me, as I read and reread them, as I prayed and listened, I felt my tangled spirit begin to untangle. I felt my breath slow and deepen. I felt a part of the natural world, governed by a good God, created with care and attentiveness. I felt my daughter-ness, my place in the family of God. And I exhaled. Taken from Present Over Perfect by Shauna Niequist. Copyright ©2016 by Shauna Niequist. Used by permission of Zondervan. www.zondervan.com. All rights reserved. 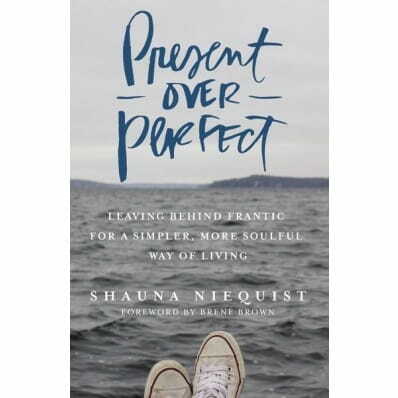 Shauna Niequist is the author of Cold Tangerines, Bittersweet, Bread & Wine and Savor. She is married to Aaron, and they have two wild & silly & darling boys, Henry & Mac. They live outside Chicago, where Aaron leads The Practice and is recording a project called A New Liturgy. Shauna also writes for the Storyline Blog, and for IF:Table, and she is a member of the Relevant podcast, and a guest teacher at her church. Shauna’s three great loves are her family, dinner parties, and books, and she believes that vulnerable storytelling, hard laughter, and cold pizza for breakfast can cure almost anything.